When you wake up in the morning, what’s the first thing you do? If you’re anything like me, you reach for your phone and check your email. I know, it’s a terrible habit. But catching up on emails allows me to check in with what’s happened overnight and get a picture in my mind of the important tasks I need to do for the rest of the day. And I’m not the only one glued to my email — stats show there’ll be 3 billion email users worldwide by 2020. Already, Gmail has 1 billion of those users. So why is email still so popular after a couple decades of Nigerian prince schemes, Viagra ads, and mountains of spam? The fact is, we’ve “grown up” with email. Email has been a fundamental part of my online identity since I signed up for my first Hotmail account in 1998. While other technologies have come and gone or struggled to retain dominance, email has continued to be the dependable workhorse that everyone relies on and no one owns. Email is a decentralized, open platform on top of which new innovative things can be built. So in that sense, email represents a different model from the closed ecosystems and technologies that are proliferating across our devices. 91% of all US consumers use e-mail daily. The rate at which emails prompt purchases is not only estimated to be at least three times that of social media, but the average order value is also 17% higher. Yes, email marketing is more powerful than it’s ever been and also far different than it was a decade ago. Advances in technology have led to huge shifts in how customers interact with business, meaning marketers have also had to evolve their tactics to keep up with constantly changing trends. In this article, I’ll run you through the email marketing changes we’re seeing this year and what you can do to plan a competitive strategy on par with industry trends. Let’s kick off with automated emails. They’ve been around for a couple years now — not just this year — but are well and truly here to stay. Think welcome emails right after you sign up for a new service and cart abandonment emails (when you’ve added that marketing book you’ve had your eye on for a while to your shopping cart, changed your mind, and then Amazon reminds you later on that it’s still sitting in your cart and could sell out any minute now). Then there are reminder emails when you haven’t logged in to your account with a particular service for a few weeks. These emails are all automated and triggered by user activity. And for marketers, they allow you to deliver the right message at the right time. According to Campaign Monitor, automated email messages average 70.5% higher open rates and 152% higher click-through rates than “business as usual” marketing messages. That’s huge. Email automation allows you to provide relevant information to your customers when they need it (i.e. “You know that thing you added to your wish list? It’s about to sell out — there are only three left!”) and also streamline your sales funnel more effectively. One service that nails simple automation is Dropbox. When you sign up for a new account but take too long to install the software on your computer and phone, the service sends you gentle nudge reminding you to complete setup. It’s a simple email that does two things effectively: encourages you to install the software and reminds you that Dropbox can be integrated on all your devices. 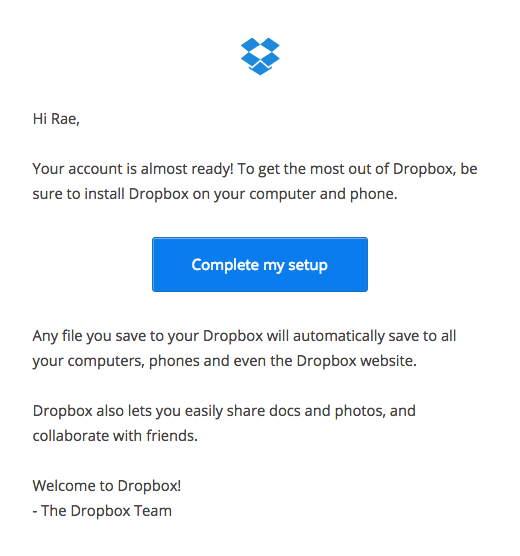 Dropbox sends an automated email encouraging users to complete setup. 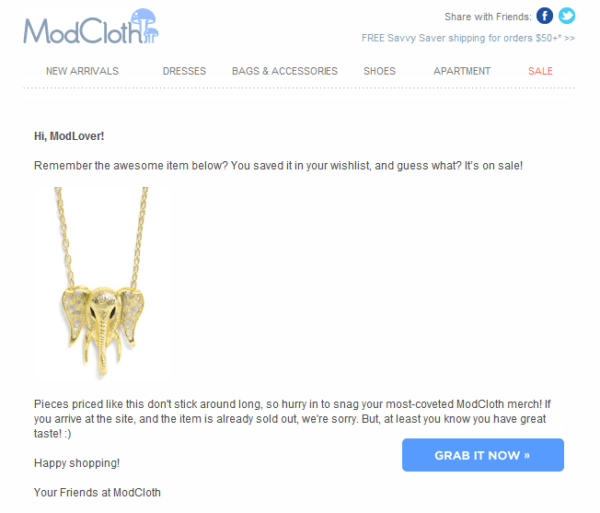 When an item in your wishlist goes on sale, ModCloth sends an automated email. This email remarketing campaign is guaranteed to drive repeat sales with the help of urgency, encouraging customers who might’ve added an item to a wishlist a couple months ago and forgot to return to your online store. Many email marketing tools already include the ability to set up automation, including Campaign Monitor, but there are some fantastic services that have sprung up in recent times that can also help you put together sophisticated email campaigns to help you nurture leads, onboard new users, upsell to customers and re-engage customers. Check out Drip, Zendesk, GetResponse, and Intercom. This year, email interactivity has brought across some of the elements you would normally see on websites into email. Instead of boring ol’ emails that are just intended to be read, this new interactivity prompts user engagement, increases interest and boosts engagement and conversion rates. Using GIFs is a great way to show customers the versatility of a product. Netflix used a GIF to advertise the latest series of House of Cards. While some interactive elements are fairly easy to include in emails, like the GIF above, there are still some technical challenges around implementation when it comes to things like quizzes and search bars, not to mention some email platforms have limited ability to work with interactive content. But as the year rounds out and we move into 2018, we’ll no doubt see services pop up to alleviate these obstacles. If an image speaks a thousand words, then a video clip is certainly worth a thousand images — or 1 million words. While most email clients are unable to display embedded video this will soon change — iOS 10 now support the HTML5 video format and other industry players are likely to follow suit. As of November 2016, more than 53% of emails were opened in Apple email apps, justifying trying embedded videos as long as there is a fall-back for subscribers with email clients that don’t support HTML5 video. Here, Monica Vinader has used a static image complete with a video play button to encourage users to watch a video off-email. Video in email is a no-brainer — it attracts higher engagement and it’s a medium that users are already familiar with, so there’s no learning curve. Using video, marketers can easily explain the features of a new product or show a model wearing this season’s latest fashions, right in a user’s inbox. Video in email is a win-win. According to Sumo, having one video in an email can lead to a 200-300% higher clickthrough rate. So if you aren’t already using video, why not give it a try? You’ve got nothing to lose and a high clickthrough rate to gain. Basically, AI and machine learning will provide greater opportunities for sophisticated segmentation and intelligent personalization. While this technology for email is still in its infancy, as it develops it will allow marketers to continuously adapt campaigns that are more tailored to the individual customer journey. Right now, there aren’t a lot of AI and machine learning options for email, but Automizy’s AI solutions, which are currently in alpha, are worth checking out to get an idea of where things are headed. Remember how I said earlier that I check my email first thing in the morning? How do I check it? That’s right, on my mobile. According to Campaign Monitor, 55% of emails are opened on mobile devices. Furthermore, 80% of users will be accessing their email from mobile devices by the year 2018. So mobile is showing no signs of slowing down. And here are some more stats: A 2016 report from Fluent showed that 38% of users have purchased from a smartphone after receiving a marketing email, while 45% go to a retail store and 47% purchase online. Influencing your customers through email and via their mobile works. So how do you go about implementing a solid email marketing strategy that leverages mobile? Firstly, make sure your email templates are responsive and work on all devices. If your emails look great on mobile, your customers are most likely to open them and interact and act on your marketing message. Keep your subject lines brief. On mobile devices, you have even less space to communicate, so keep your subject lines short and sharp. As a general rule, it’s best to stick to 30 characters or less. Ensure your content is focused. When a user opens their email on a mobile device, you’ve got less time to capture their attention than if they were opening the same email on their desktop. So make the most of the shorter attention span with less text and more images. Clear CTAs. There isn’t a lot of room to move on a mobile device, so you need to ensure your any buttons have clear text and are big enough to click, because if a user finds it difficult they will simply give up. Use preheader text. Users will decide whether to open (or swipe to delete) your email based on your preheader text, so it needs to be engaging and compelling. Spotify emailed artists a wrap up of 2016 using personalized data. As 2016 wrapped up, the streaming service sent emails to musicians using personalized data. Not only was this a fun way for Spotify to share data with the people who create the music it shares, but many users took to social media to share their emails with their followers — a social win for Spotify. Last year highlighted just how vulnerable we are to email hacking: Yahoo revealed that 1 billion user accounts were hacked in 2013 and another 500 million in 2014, and the Russians hacked the Democratic National Committee’s emails. Email also got a bad rap when it was exposed that Hillary Clinton was using a private email server. Gmail already highlights which emails are encrypted using a little lock icon to show which are sent using transport layer security. It’s only a matter of time before another major email provider follows Gmail’s lead and encryption gains momentum towards becoming best practice. Omni-channel marketing focuses on providing a seamless purchasing experience across as many channels as possible to reach the target audience. For example, you might see a new TV you like in a television commercial, research it on your mobile phone while sitting on your couch, order it on your laptop, and then pick it up in-store. Essentially, omni-channel marketing delivers a consistent and uninterrupted experience across multiple channels and devices — the aim is to provide a customer experience that is seamless when the person moves between interacting on your website to reading an email or even visiting a physical store. Email plays an important role in the omni-channel experience. For instance, say you have a store that sells shoes. After a customer signs up to your mailing list while visiting one of your physical stores, you can inform the customer about this season’s latest trends via email, trigger a message when a customer abandons a cart, and provide a reminder when a product in a customer’s wishlist is on sale. While many businesses might think they are already doing omni-channel marketing because they have a website, email list and social media account, the simple act of communicating on a range of different platforms is not omni-channel marketing. Omni-channel marketing involves integrating various platforms to provide a unified customer experience that is fluid and consistent for the customer. You’re probably thinking that omni-channel marketing is a lot of effort and, I hate to break it to you but it sure is. But according to AdWeek, 62% of companies have, or plan to have, an omni-channel marketing strategy. And on top of that, 70% of businesses say that omni-channel strategies are important, very important, or critical to their success. So if you’re not already going it, it’s time to get on the bandwagon. What Will Email Look Like in 2018? Email marketing has well and truly evolved past simple static emails. There have been huge leaps forward in the past five years with a greater focus on personalization and more interactive elements, data gathering, and automation. If you aren’t already using many of the tactics outlined in this article, it’s time to update your email strategy so you’re not left behind as email continues to evolve and marketers become savvier in delivering to customers what they want before they even know it. Are you using any of these email marketing trends? Share your own email predictions in the comments below. What an inspirational list of trends and predictions! Well done. Great Article Jenni! really helpful thanks for sharing. I think live social media feeds in the emails is now becoming a trend that supports campaigns on social and other channels. and also mobile optimization can grade up the ranking factors and increase the productivity. for emails I personally used a tool called Aeroleads and it really helped me a lot for my business growth. Cool insight into email marketing.